BANGKOK, Thailand – When Cyclone Gita tore through the Pacific in February 2018, the storm surges, flooding and gale force winds caused severe damage across Tonga, Samoa and Fiji’s remote Lau island group. The Category 4 storm was described as the worst to hit Tonga in 60 years, damaging thousands of homes and flattening Parliament House. Working through the Pacific Humanitarian Team to support the Government of Tonga’s response, UNFPA was able to respond quickly to the needs of women and girls on the ground thanks to life-saving sexual and reproductive health and protection supplies that had been prepositioned in the Australian Aid warehouse in Brisbane, Australia. These supplies – including dignity kits, clean delivery kits and tents to establish women-friendly spaces – were airlifted, alongside other relief shipments provided by Australia, just days after Cyclone Gita struck Tonga. The prepositioning of these supplies is part of a regional initiative managed by UNFPA and supported by Australia’s Department of Foreign Affairs and Trade (DFAT). Strategically prepositioning supplies has enabled a faster, more efficient and higher-quality response to regional humanitarian crises. For example, the dignity kits stored in the Brisbane warehouse had been customized specifically for the Pacific context, and included culturally appropriate items that the women and girls in Tonga needed immediately. Prepositioning supplies also saves money and is better for the environment. For instance, these bulky supplies were initially transported to the prepositioned location by sea, thereby saving tens of thousands of dollars. Between May 2017 to March 2018, 56,000 people affected by emergencies across the Indo-Pacific region benefited from over AUD 1 million worth of supplies distributed through this initiative. These supplies reached people displaced by volcanic activity in Indonesia, Vanuatu, Papua New Guinea and the Philippines; people affected by flooding in Magway, Myanmar; survivors of the Marawi crisis in the Philippines; communities affected by the earthquake in Papua New Guinea; and those affected by Cyclone Gita in both Tonga and Fiji. 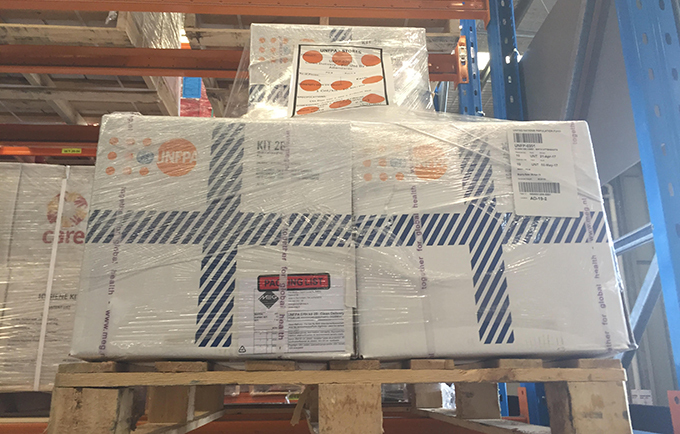 UNFPA supplies at the warehouse in Brisbane, Australia, in July 2017. Image from UNFPA/DFAT.